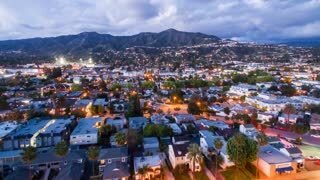 Search Results for "mushroom clouds"
Aerial timelapse in motion (hyperlapse) shot at sunset in Los Angeles at twilight with lightning mushroom clouds forming changing from day to night with mountains in the back and LA city traffic intersection and streets below. Atomic bombs are dropped in Hiroshima and Nagasaki, forcing Japan to surrender WWII. 1961 - Animation is used to show USAF forces fighting back against enemy ballistic missiles. 1951 - American troops drop to the ground on a battlefield in light of an atomic attack. Various nuclear devices explode into mushroom clouds at the Pacific Proving grounds during Operation Redwing. The Huron, Mohawk and Tewa nuclear test shots explode into mushroom clouds in the Pacific Proving Grounds during Operation Redwing. Operation Greenhouse nuclear tests in the South pacific in 1951 as test buildings are destroyed by blast. When nuclear bombs explode, mushroom clouds yield millions of radioactive particles (represented here by animation) in 1959. Atomic bombs dropped by warplanes explode into mushroom clouds in Japan in World War 2. 1955 - A nuclear device explodes into a mushroom cloud a house is destroyed and troops return from the trenches and Director of the Federal Civil Defense Administration Val Peterson is shown at the Nevada Test Site. 1951 - Dr. Norris Bradbury speaks about nuclear tests at a meeting at Los Alamos National Laboratory in New Mexico. 1954 - A nuclear device is detonated and the resulting mushroom clouds are shown at Bikini Atoll. 1954 - Jeeps are placed near an atomic bomb test at Bikini Atoll, so the effects of dynamic pressure can be studied. 1954 - "Tuna can" cylinders are assembled to gauge underwater radiation. 1954 - The craters left by atomic bomb tests around Bikini Atoll are measured. 1954 - A B-36 is flown through a radioactive area to collect data. 1954 - Instrumentation is set up across Bikini Atoll to gauge the effects of radioactive blast. 1954 - Underwater instrumentation is put in place to detect the effect of radiation on waves around Bikini Atoll. 1954 - Underwater Soviet and American mines are tested for endurance at Bikini Atoll. 1954 - The devastation on Eninman Island after an atomic bomb test is shown, focusing on structures. 1954 - Extreme damage left in the wake of a nuclear attack is shown. 1954 - An atomic bomb is detonated on Eninman island, near Bikini Atoll. 1954 - A map shows the distance traveled by radioactive fall-out from Bikini Atoll. 1954 - B-47s and B-36s are approved to transport nuclear weapons. 1954 - A map of Washington DC and its surrounding areas is used to illustrate the impact a mega-ton atomic bomb would have. 1954 - An aircraft releases a bomb attached to a parachute. 1954 - Before and after imagery is shown of trees on Eninman Island, proving grounds for the hydrogen bomb. 1954 - A map of Washington DC and its surrounding areas is used to illustrate the distance thermal radiation could travel after a nuclear attack. 1954 - Systems aboard US Navy battleships to detect nuclear fall-out are shown and explained. 1954 - The benefits of a warship "wash-down" are explained as curbing some effects of radioactive fall-out. 1954 - A B-47 is flown through a radioactive area to collect data. 1954 - Different tools used for collecting data on nuclear fall-out are shown. 1954 - Radioactive damage on a B-36 is shown. 1954 - Animation is used to show how far thermal radiation could reach. 1954 - Speculation is shared about the effects of radioactive fall-out on native people and wildlife near the Bikini Atoll atomic bomb tests. 1954 - Buoys are fitted with radio transmitters to collect information about atomic fall-out, but prove ineffective. 1954 - US Navy battleships are prepped for nuclear fall-out tests. 1954 - An illustrated map shows dosage levels of radioactive fall-out that reached Rongelap from Bikini Atoll. 1954 - Animation is used to show the likelihood of various shelters to protect inhabitants from nuclear fall-out. 1954 - Two US Navy ships are controlled remotely and subjected to nuclear fall-out tests. 1954 - Radiation levels are measured on two US Navy ships which participated in a nuclear fall-out test. 1954 - Data on radioactive fall-out is collected from gamma meters near Bikini Atoll. 1954 - A busy city is shown while a narrator explains why evacuation after a nuclear attack is unlikely. 1954 - The impact of thermal radiation is shown in graphs and footage. 1954 - An atomic bomb is detonated off Bikini Atoll.